House of the Dead: Overkill has had 30,824 players report play-time data on the Nintendo Channel, since the game released in February. The Conduit was released in June, and has had 45,061 players report play-time data on the Nintendo Channel. 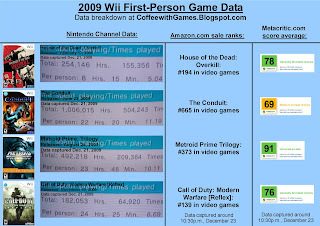 Metroid Prime: Trilogy has had 20,708 players report their data, since the game released in August. Call of Duty: Modern Warfare [Reflex] was released just in November and has 7,470 players report data on the Nintendo Channel. House of the Dead: Overkill's Amazon.com sale rank is #194, and is selling for $13.79. The Conduit's sale ranked is #665 and is selling for $27.99. Metroid Prime: Trilogy is ranked #373, and is selling for $35.99 from Amazon.com 2nd Party/3rd Party Sellers, because Amazon.com doesn't have Metroid Prime: Trilogy in stock. Call of Duty: Modern Warfare [Reflex] is ranked #139, with a selling price of $44.99. Again, Call of Duty: Modern Warfare [Reflex] was the only game out of these four, this week, to see an increase of game-play data reporting by 1,000 more players than last week. Metroid Prime: Trilogy, for some reason, still isn't in stock on Amazon.com, and it's only available from 2nd or 3rd party vendors. House of the Dead: Overkill had 621 more players reporting data this week, than last week. The Conduit had 998 more players reporting data this week. Metroid Prime: Trilogy had 810 more players reporting data this week. Call of Duty: Modern Warfare [Reflex] gained 1,286 more players reporting data in the last week. Last week, The Conduit needed just 18,658 reported play-time hours to cross one million "Total" game-play hours, and it actually gained 24,672 game-play hours this past week, crossing one million "total" game-play hours reported. I think it will be interesting to see how these games perform in the few weeks following Christmas, and if we'll be able to tell from the number of players reporting data, if it looks like gamers received some of these games as gifts. Did any of these games make your Christmas list? @Coffeewithgames: To your last paragraph, I think it will be interesting and also since people have time off, no school and Christmas break for adults to see if this (pun intended) shoots the play time data up. I may pick up House of the Dead. I've always loved the corny and over the top drama those games present. Side note, did you know that Call of Duty: Modern Warefare 2 sold 4.7 million copies across all platforms on its opening day? Phew. Just think how many it would be if it was out on the Wii! No none of them made my "list". This being mostly because I own three of them, and the other, Call of Duty, I'm not interested in. As far as my Christmas list video games go, I asked for Silent Hill: Shattered Memories, Muramasa: The Demon Blade, and Klonoa. We'll have to see tomorrow. I don't think Call of Duty: Modern Warfare 2 would have sold many more copies. Call of Duty: World at War did sell more than a million copies on the Wii, but it took many months for it to do so...I say COD:MW2 would have maybe sold more than 5 million copies if it was also released on the Wii. Hopefully you got one of the games on your list. Gift cards have done me well, so I can now buy/rent games! I'm pretty excited to start a "review" system for the site...I'm just trying to get a good video capturing system so I can have some game-play footage with the games I "review".